You won't be able to watch this video on an iPad—it doesn't support Flash. That's just one of the reasons why I won't be getting one. 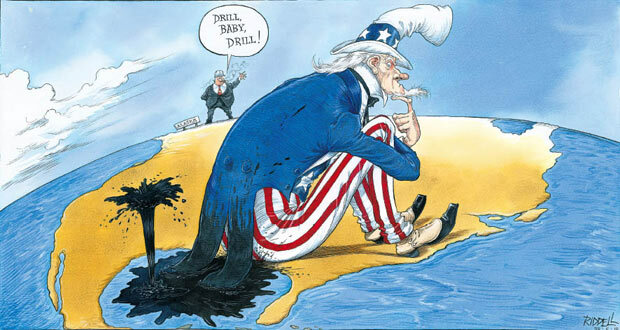 This cartoon by Chris Riddell from The Observer is a comment on the conundrum facing the United States following the Deepwater Horizon oil spill in the Gulf of Mexico. We see Uncle Sam sitting on a representation of the United States. 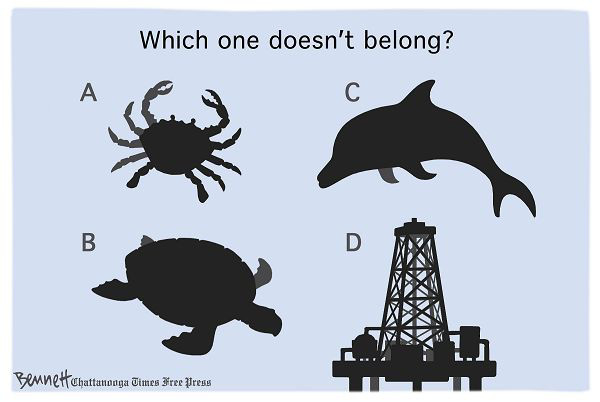 His coat tails are trailing in the Gulf of Mexico, where oil is gushing from the sea. At the other end of the country in Alaska, a cigar-smoking oil executive is waving and saying "Drill, Baby, Drill!" Get your students to produce their own infographic on a topical subject. A kit is a group of items that are kept together, often in the same container, because they are all used for similar purposes. • An accident investigation kit includes basic crash investigation tools such as binoculars, digital recorders, high resolution cameras and global positioning system (GPS) units to track aircraft position, hand gloves and shoes, among other tools. The Sun's headline uses two literary devices. The repetition of the 'c' sound is an example of alliteration, and the phrase 'cannibal cops' is an example of hypallage, also known as a transferred epithet. This is when a modifier, usually an adjective, is applied to the "wrong" word in the sentence. In this example, the police are obviously not cannibals—the epithet should really apply to the alleged killer. If someone is floored by something, they are made to feel so surprised and confused that they cannot react. • The singer looked amazing, but her dance with Derek was what really floored the judges. Now that really is shocking. A good subject for discussion though. Who should we blame? The father? The tobacco companies? The Indonesian government? Should we be making value judgments at all? What do you think? This cartoon by Martin Sutovec (aka Shooty) shows a car salesman talking to a potential customer in a car showroom. The salesman explains that the "world's first water powered car" only runs on water from the Mexican Gulf. 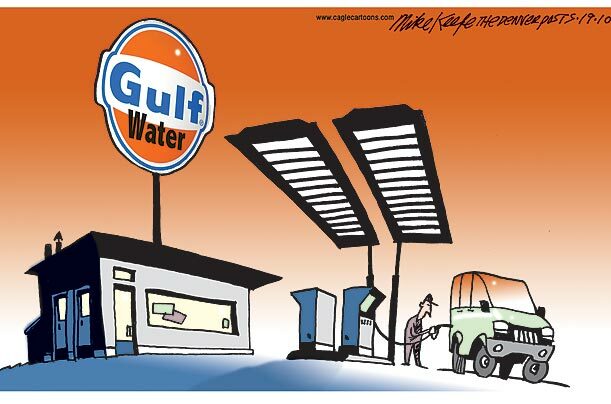 The joke is that due to the leaking BP oil well, the water from the Gulf of Mexico contains enough oil to run the car. Junk is old and used goods that have little value and that you do not want any more. • The city's annual junk collection event will be held at 8 am-noon June 5, at 64th Street and Johnson Creek Boulevard. It's iPad day today in the UK (and France), when the device officially launches. To mark the occasion, here's a video showing what you can do with an iPad, some Velcro, and a bit of imagination. I'm not sure all of those uses were strictly legal! And using an iPad in the kitchen doesn't seem like a great idea either. 1. Show students the video and then see how many of the different uses they can remember. 2. Get your students to imagine other possible uses for the iPad. I actually got my hands on an iPad for the first time this lunchtime at the FNAC. The English Blog looks very nice on that big screen! And the demo photo album was wonderful. I don't think I'll be buying one yet, however—I'm not really sure what I would use it for. I can play Scrabble on my iPod Touch, and the iPod won't fit into your pocket. A sort of intermediate device—the size of a paperback—might be more useful. A man is examining a plate of tiny tapas with a magnifying glass. The joke is that due to the new austerity measures, the size of the tapas has been reduced to minuscule proportions. 2. Tapas are small plates of food that are served with drinks, or before a main meal. The custom originated in Spain, but you now find tapas bars in many other countries, including France and the UK. Newsy Video: EU Nations Pledge to Cut Budgets—Is It Enough?